The nuclei of atoms found in nature typically have about the same number of protons and neutrons, and are stable – that is they remain intact forever. Increase the imbalance between the numbers of protons and neutrons, however, and the lifetime of an atomic nucleus can decrease remarkably, sometimes to being so short that we wonder whether we should even call the system "a nucleus." 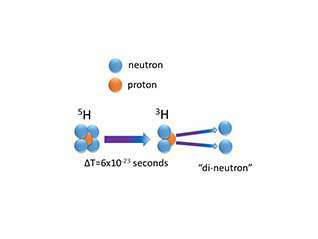 A team of researchers studied the very unusual and extremely short-lived species of hydrogen consisting of a single proton and four neutrons known as 5H ("hydrogen five"). Their aim was to learn about systems of protons and neutrons that fly apart almost as soon as they are formed, but nonetheless leave an observable trace of their fleeting existence. The team was able to show that 5H survives for about 6x10-23 seconds (sixty trillionths of a trillionth of a second or 60 "yocto-seconds") before two of its four neutrons fly away leaving a smaller radioactive nucleus of hydrogen known as 3H or "tritium." This interval is roughly the same as the time it takes light to travel a distance about four times the size of the nuclear 5H system. Despite its very brief existence, we are still tempted to call 5H a "nucleus." The study provided new information about how neutrons can interact with each other, and suggested that the arrangement of the neutrons in 5H is very similar to that of an exotic isotope of Helium, 6He, which consists of two protons and four neutrons. Removing one proton from 6He makes the system unstable. The characteristics of systems that are almost purely made up of neutrons can lead to a better understanding of how collections of neutrons behave in environments as different as a single diffuse nucleus, a nucleus that contains some particles that are not even neutrons or protons, or the surface of a neutron star. To make 5H, the researchers used a reaction that removed a single proton from energetic 6He nuclei produced by the National Superconducting Cyclotron Facility at Michigan State University traveling at 33% of the velocity of light. By analyzing the reaction products, the team could determine not only the lifetime of the resulting 5H, but also the amount of energy released when the 5H disintegrates. In 6He, sophisticated calculations have already shown that the two of the four neutrons travel together around a tightly bound core made up of two protons and the other two neutrons. Those calculations are unable to describe fully a system that is as short-lived as 5H, but with some approximations can begin to give a picture of its internal structure. It was found that as the system breaks up, the neutrons retain a memory of how they were arranged in the original 6He nucleus, and that the two that fly away may emerge together in a state sometimes called a "di-neutron" that quickly separates into two neutrons. The work will help guide the development of theories describing neutron interactions and the properties of very short-lived nuclear systems.